Want to have some fun? Put six women in a situation they probably haven’t been in since the first grade, add wine and stir. A recent trip to an art studio/bar for a friend’s birthday celebration was a welcome surprise. However, I was so confused about the concept. I drove her crazy trying to conceptualize what we were all getting in to. My side of the conversation went something like this: “We’re going to paint and drink wine?” “How are we going to paint?” “What will we paint?” “I can’t paint!” I knew one thing – I was in for the wine and girlfriend time. Bring on the art smocks! Now what? We’re supposed to make our canvas look like the one in the brochure? Sure. Five easy steps to Van Gogh. Would I ruin the canvas with the first stroke? Was it the wine or the child-like enthusiasm that kept us having so much fun? In retrospect it seemed like the sheer joy of creating something that wasn’t there, and each woman adding her own spin to it, was the MOST fun. 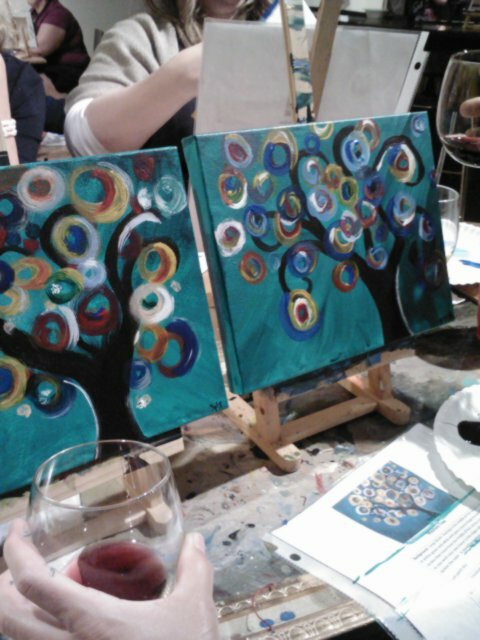 No matter what our backgrounds or experience, we were undeniably all artists that evening. I highly recommend the experience to anyone given the opportunity. And wouldn’t it be amazing to challenge yourself to do something, anything creative in the upcoming weeks if you haven’t tapped in to that side of yourself recently? What would YOU do? Leave a comment – keep me posted!